I would like to thank you again for your another accurate forecast. This time it makes me $1000 richer again. This is my second time to hit a prize on this month. 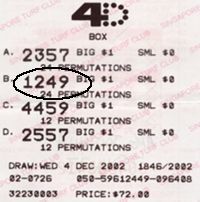 On the 04/12/2002, I had bet $1big system bet on 1249(Newsletter Season system number) and $3 big on the direct number 2419. This number 1249 also appears on the Assemblix web site as the December season number. And this number 2419 came out as a starter prize. I am so happy that I didn’t make the wrong choice to join this service. I would like to thanks KL Tan for his accurate forecast to make me $1000 richer. I have made a total of $7000 this month and looking to win hit some more prizes in the future.